The keyboard that fits in your pocket. With technology becoming increasingly wireless and more mobile everyday, this projection keyboard was bound to come along sooner or later. Back last year, around the launch of the iPhone 4S when the usual rumours and speculations surrounding any iProduct were close to breaking point, a nifty video came out which depicted a conceptual iPhone 5 device that came with a virtual keyboard projected by the device itself. Though the imaginary device and most of its features were simply castles in the sky (iPhone holograms anyone? ), a few companies took to the virtual keyboard idea and these have since been released. 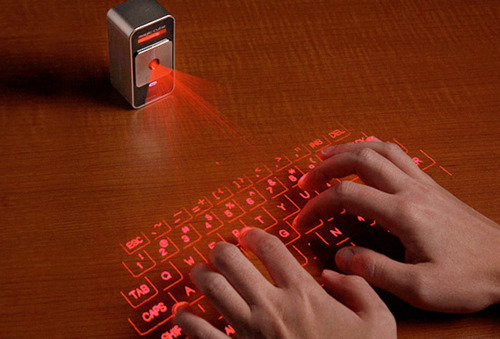 Celluon has released the best of these virtual projection keyboards in the form of their ingenious Magic Cube. About the size of a pack of cards, the small rectangular-shaped device looks like something straight out of Star Wars, and its amazing laser projection and motion detection technology would make a great travel companion for mobile, tablet, and laptop devices. The pros are that it connects via Bluetooth or USB, and is compatible with a whole array of devices including iPhones, iPods, iPads, computers, notebooks, smartphones and many tablets. However the cons are that it only projects a condensed QWERTY keyboard layout (there is no right side number pad). In addition, it is not for use with Kindle devices (they do not support Bluetooth or USB keyboards) and the projected multi-touch mouse pad and keyboard can be quite tricky to use. Nevertheless, the unit seems to get more responsive and accurate the more you use it (maybe it just takes time to get used to) and it’s still an amazingly forward-looking and cool gadget. – Keyboard function compatible with any operating system supporting the USB HID class or Bluetooth HID profile. Multi-touch mouse mode for Windows 7+ only. Specific compatible systems include Win XP SP2+, Vista, Win7, Mac 10.4+, iOS 4.3.5+ (iPhone 3GS and later, iPod Touch 2nd generation and later, all versions of iPad), Linux and others supporting standard Bluetooth HID keyboards. Android 2.0+ compatibility limited to phones and devices that include Bluetooth keyboard support.